Classic seasonal pumpkin baked with cinnamon spice topped off with tart cranberries and a streusel topping for a fall time favorite! Ingredients: PUMPKIN, LOWFAT CULTURED BUTTERMILK (CULTURED PART-SKIM MILK, NONFAT MILK, SALT), SUGAR, EGG WHITES, WHOLE WHEAT FLOUR, ENRICHED BLEACHED FLOUR (WHEAT FLOUR, MALTED BARLEY FLOUR, NIACIN, REDUCED IRON, THIAMIN MONONITRATE, RIBOFLAVIN, FOLIC ACID), WHEY PROTEIN CONCENTRATE, CRANBERRIES (CRANBERRIES, SUGAR, CITRIC ACID, ELDERBERRY JUICE CONCENTRATE COLOR, SUNFLOWER OIL), ROLLED OATS, RESISTANT MALTODEXTRIN, BROWN SUGAR, WHEY, PALM OIL, SPICES, MONO AND DIGLYCERIDES, OAT FIBER, BAKING POWDER (SODIUM ACID PYROPHOSPHATE, SODIUM BICARBONATE, MONOCALCIUM PHOSPHATE), MODIFIED CORNSTARCH, POLYSORBATE 60, NATURAL FLAVORS, SODIUM CASEINATE, beta carotene COLOR, BAKING SODA, SOY LECITHIN, DIPOTASSIUM PHOSPHATE, XANTHAN GUM, DATEM. 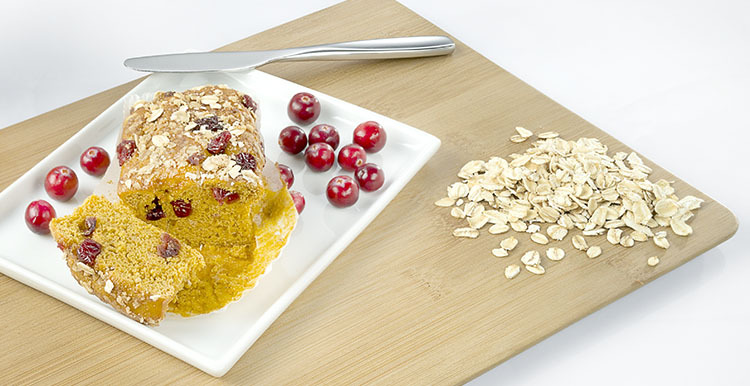 Nutrients: PUMPKIN, LOWFAT CULTURED BUTTERMILK (CULTURED PART-SKIM MILK, NONFAT MILK, SALT), SUGAR, EGG WHITES, WHOLE WHEAT FLOUR, ENRICHED BLEACHED FLOUR (WHEAT FLOUR, MALTED BARLEY FLOUR, NIACIN, REDUCED IRON, THIAMIN MONONITRATE, RIBOFLAVIN, FOLIC ACID), WHEY PROTEIN CONCENTRATE, CRANBERRIES (CRANBERRIES, SUGAR, CITRIC ACID, ELDERBERRY JUICE CONCENTRATE COLOR, SUNFLOWER OIL), ROLLED OATS, RESISTANT MALTODEXTRIN, BROWN SUGAR, WHEY, PALM OIL, SPICES, MONO AND DIGLYCERIDES, OAT FIBER, BAKING POWDER (SODIUM ACID PYROPHOSPHATE, SODIUM BICARBONATE, MONOCALCIUM PHOSPHATE), MODIFIED CORNSTARCH, POLYSORBATE 60, NATURAL FLAVORS, SODIUM CASEINATE, beta carotene COLOR, BAKING SODA, SOY LECITHIN, DIPOTASSIUM PHOSPHATE, XANTHAN GUM, DATEM.